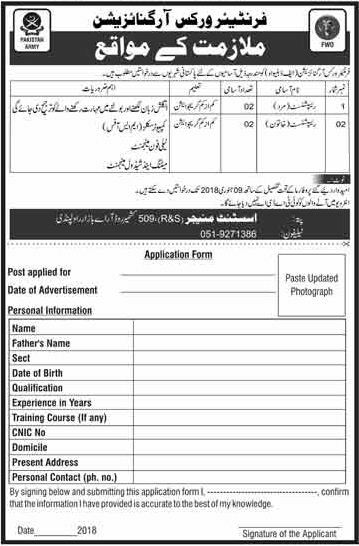 Frontier Works Organization (FWO) 04 Jobs 06 Jan 2018 Daily Dunya. Frontier Works Organization has announced 04 latest Jobs in Daily Dunya Newspaper. Jobs titles and number of posts is as follows, Receptionist (Male) 02 Posts, Receptionist (Female) 02 Posts. Interested Candidates can send their application on below prescribed Performa till 09 January 2018. Candidates must be proficient to read and write English language, as well as expert in telephone management, computer skills and meeting and schedule management. Frontier Works Organization (FWO) 04 Jobs, 06 January 2018.